Probate, a court-supervised proceeding, normally is required when a person dies. Probate facilitates the transfer of property from a deceased person to those entitled to an inheritance. In some states, probate must be opened within a certain time frame. However, failure to do so does not necessarily mean that the property remains in the deceased person's name permanently. In some states, the property can instead be transferred by petitioning the court for a determination of heirship. In most states, probate is required by law if a deceased person died owning any probate property. Probate property does not transfer automatically at death and is distinguished from non-probate property, such as life insurance, payable on death accounts and trusts. This is true regardless of whether a person died with or without a valid will. In some states, including Missouri, if the probate process is not initiated within one year, regardless of the reason, the matter is permanently barred from probate. Failure to timely file also results in any existing will being declared invalid. If the period for probate has passed and the deceased individual has probate property still in his name, any person considered an heir may draft and file a petition for heirship. Here, the term heir refers only those entitled to receive property under the state intestacy laws as any existing will bequests would be invalid. Although state law can vary, these laws prioritize close family members, like spouses, children, and parents. These laws can be complex, and you may choose to consult an attorney to determine the order of inheritance in your state. Although state law can vary, the petition typically must include the name and address of the deceased person, the names and addresses and relationship of all heirs of the deceased person, and a description of the property subject to the action. You may need to include a copy of the death certificate and notify all of the other heirs as part of the filing process. The court will then hold a hearing. At the hearing, a judge will need to see evidence regarding both the nature of the property and the relationship of each heir to the deceased person to verify the information in your petition. Once the hearing is complete, the court issues a judgment ordering the transfer of ownership of the deceased person's remaining property to his heirs. Certified copies of the judgment can then be used to obtain the property if it is being held by a third-party, such as a bank. Additional steps may be required depending on the type of property. For instance, changing ownership of real estate typically requires the creation of a deed and recording the transfer in the land records. Note that in some states a determination of heirship is not only used as an alternative when probate is not an option, but can be requested as part of the standard probate proceeding as well, provided the person died without a will. The determination can be helpful for the person in charge of administering the estate, referred to as a personal representative, and will give him some certainty and court backing as to who is entitled by law to receive what portion of the estate before any transfers are made. 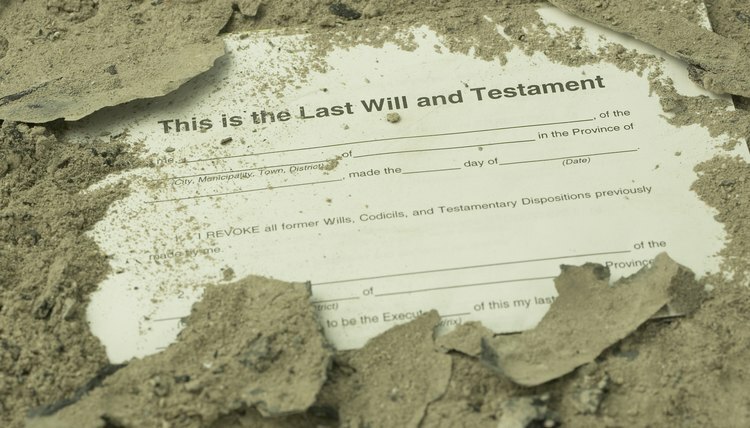 If a Wisconsin resident dies intestate -- without a will -- the probate court distributes the assets of the estate to relatives as dictated by the state's law of intestate succession. Those relatives must prove their status as heirs of the deceased before receiving estate assets at the close of probate. To determine heirship, the Wisconsin probate court requires evidence and a hearing. The purpose is to verify the identity of heirs and their right to receive property of the deceased.